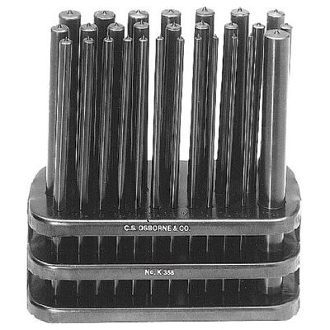 This 28 piece transfer punch set is made high strength steel with a black oxide finish, for long lasting durability. It includes 3/32” – 17/32” punches, in 1/64” increments, that are used to transfer one hole to another, quickly and easily. Set includes a steel storage rack that allows you to easily view and access the punch you need. Made of tool steel, this set should last for years of heavy use.